THE clinking of wine glasses, clicking of designer heels and the cacophony of foreign languages… welcome to a typical lunchtime in Santa Catalina. Palma’s trendiest neighbourhood is often described by locals as ‘the village in the city’, and there is no doubt it has a very distinct look and feel about it. With the city’s best food market, some of its most exciting restaurants and, bit by bit, some of the coolest shops, it is little surprise that Santa Catalina has become – by the square metre – one of the most expensive places to buy in Spain. 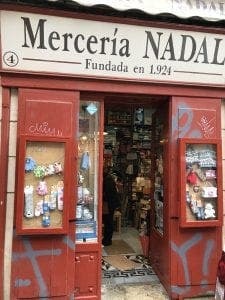 The area may be small – only seven streets wide, stretching from Feixina park to busy Calle Joan Crepsí – but it has literally exploded over the last few years. 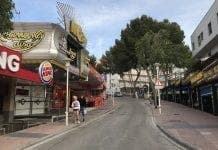 There has been a huge influx of expat buyers, in particular Scandinavian, and Santa Catalina today is vastly different to the area that Palma residents remember just a decade ago. 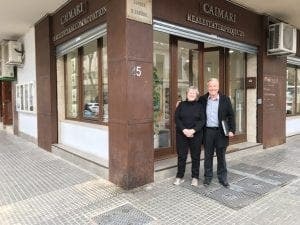 “It’s amazing how much it has changed in such a short time,” explains estate agent Miguel Llinas, from First Mallorca. “We have seen houses selling there for up to two million euros and it is not just the international market that loves Santa Catalina. We are increasingly getting local Mallorquins also looking to buy,” he explains. This is perhaps no surprise, as the suburb increasingly becomes THE place to eat in Palma and more and more hip and trendy people move in. 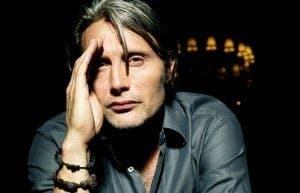 This includes James Bond villain Mads Mikkelsen, 52, who has already snapped up three properties in the area, the Olive Press can reveal. The Hollywood heartthrob, who also starred in the hit US series Hannibal, ‘has bought one apartment for himself and two for his wife and daughter’, a source reveals. Aside from Mads, who is regularly seen shopping in the market and eating out, you have a number of professional golfers, as well as leading European models investing here. “There’s SoHo in New York, there’s Soho in London, and now there’s Santa Catalina,” local entrepreneur Francesca Lagartera tells the Olive Press. “There is always good food to taste and wine to drink, and more importantly there are so many interesting and friendly people around the streets,” she adds. This is one of the main differences between Santa Catalina and the rest of Mallorca – the crossing of so many cultures and background in one small neighbourhood. “Everyone co-exists really well, and appreciates the international feel – it’s not segregated and people are open and friendly,” co-owner of B Connected Vintage Design Angela Kholodny, from New York, explains. This is all too apparent when walking through the streets, even on a rainy day, with most people making the effort to nod hello and even the shopkeepers at least trying to smile. This is the clear pride in the neighbourhood that everyone shares. Her story is so typical of the new residents flocking into Santa Catalina, the Berliner having worked in fashion and marketing before moving to the island with her Dutch boyfriend Vincent, who owns three restaurants in Barcelona. And then you’ve got Ronny from Greece, Irene from Peru, Luke from the UK, Ricardo from Italy and Bernabe from Argentina… all owning their own restaurants here. 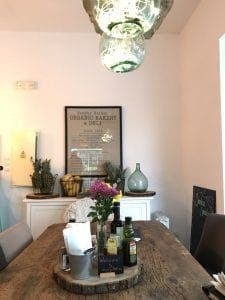 There is no doubt the vibes in the area revolve around the concept of fresh, healthy and authentic ingredients. Locally sourced products are the norm for the neighbourhood… and beyond this, many establishments boast using local pottery, tiles and decor, fabrics, packaging and endless other Mallorcan-made goods. 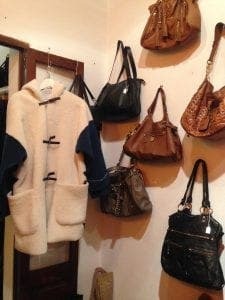 Second hand shops are beginning to thrive in the area, where reusing and recycling is a priority, including Flamingo’s offering vintage American goods, and BConnected Designer Vintage with isles of top designers from across the decades. Santa Catalina however, has not always been the trendy village it is today. Its history began with fishermen and flour millers, and later numerous factories covered much of what we find today. The neighbourhood is named after an old hospital, dedicated to Saint Catalina of Alexandria, appropriately, the patron saint of sailors and merchants. Santa Catalina – and its seafront neighbour El Jonquet, which is usually included within its orbit – were the first areas outside Palma’s old town to be built up with houses. Palma was overcrowded, but there was a ‘no build’ law outside the city walls, until finally a piece of the wall was taken down, and Palma had its first expansion. In 1865, a series of ship captains and shipbuilders began constructing charming two and three storey houses from the sea up into the middle of Santa Catalina. Soon they were joined by fishermen, rope makers, and flour millers, who built a variety of houses with colourful facades, and tradition wooden shutters. In 1897, a Palma town planning contest was held with proposals for expanding Palma westwards. This was won by Bernardo Calvet, whose plan for wide streets and low buildings letting in light and fresh air came into effect, in contrast to the dark and narrow streets in the old city. Calle Fabrica – the main street in Santa Catalina – still represents this vision today. The wide streets leave room for pedestrians and large restaurant terraces, which are ideal next to the low buildings, letting the sun shine all day long. “This is what really makes the area so popular today with northern Europeans,” explains Christine Silke Leja, boss of leading real estate company B Connected, who is often credited with first making the area fashionable. The year after Calvet’s plan was adopted, a theatre was built and to this day the Mar i Terra Theatre is a key cultural centre and drama school. Shops and businesses popped up along Calle Industria, furthest from the sea, with factories occupying most of the business space until the line of windmills near the sea, a number of them still existing to this day. Take a walk around the back streets around Calle Industria and you will find a series of unique Andalusian-style cottages, that still today boast the modest size, colourful facades and traditional green shutters. But the best was to come in 1920, when the famous Santa Catalina market was first built, with a local branch railway line running through the middle. It became the lifeblood of the area and one of the key markets for the whole city… and to this day is still supplying fresh fish, meat and vegetables to the local area… and many of the local restaurateurs. “I get almost all my food from the market,” says Chilean chef, Hector Marcelo, from Fulla d’ostra. “It’s fantastic. I go early like many chefs around 8 to 8.30am and get all my vegetables, lots of fish and meat and flowers of course. The neighbourhood served as a simple village for traders and workers for many decades. Things went well until the 1960’s when the booming tourism industry took a grip on Mallorca, leading to decades of growth with new holiday resorts popping up along the coast, east and west of the city. Santa Catalina started to fall through the cracks and fell into disrepair. Many of the original tradesmen and workers, moved to work in the tourism industry, leaving the central city location behind. Bit by bit this led to the area becoming dilapidated, with various homes becoming squatted or taken over by gypsies, and numerous drug dealers and users. The charm however, never went away and it was thanks to a few pioneers, who could see the true potential of the area that helped to bring it back to what it is today. One of these was Antonia Martorell, 67, a local from Santa Ponsa, who launched her first real estate business in Santa Catalina in the early 1980s. A woman with a very international outlook, having lived in London, Germany and Stockholm, she could see the potential of the rundown area thanks to its close location to the marina and central Palma. She started to buy up and renovate old apartments in the area, the majority to rent or sell to yacht captains, many of them British. “I realised there was a market for these guys once their boats were out of the water come winter time. Where would they live? I started buying and restoring properties with a South African boat owner and soon we had 14 of them, all of them rented. Today Antonia has 53 apartments and runs the highly successful Caimari Real Estate from the heart of Santa Catalina.